My friend Mary Ann dropped off a surprise for me. Sweet!! What a sweet friend! How cool is that!!!! Merry Christmas!!! 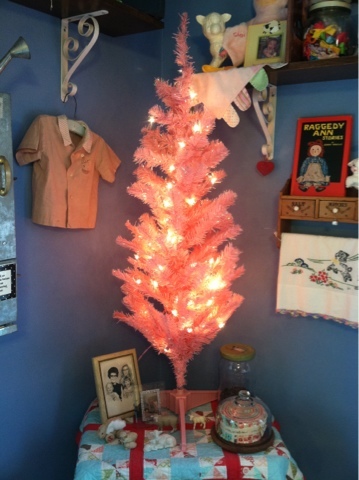 I saw my first pink tree when we were at Frankemuth a couple of weeks ago. It was prettier than I thought a pink tree would be! How nice of your friend to drop this off . I love thoughtful friends like that! Hope you have a blessed Christmas! What a sweet little tree. Hope you have a VERY Merry Christmas Amy. this is adorable....i have a silver tree up this year!! If you change the decorations to hearts, you can leave it up as a Valentines tree.